Thomas Dunne Books (St. Martin’s Minotaur), New York, 2006. 280 pages. I so enjoyed David Skibbins’ first book, Eight of Swords, I quickly snapped up his second Tarot Card Mystery. This book also features the extremely quirky reluctant detective Warren Ritter. Even though he’s used to running from trouble or suspicion or intimacy, he’s sticking around Berkeley because of the new love in his life. In this book, we again find Warren riding the heights and depths of his manic-depressive condition, and again getting unjustly suspected by the police. Like the first book, the story is fun, absorbing, and unpredictable. We learn about a series of mysterious deaths which might all be accidents. Or are they a determined pattern, with Warren’s old girlfriend on target to be the next victim? I didn’t particularly like it that Warren was asked to investigate these deaths by the leader of “The Church of the Arising Night,” worshippers of Satan. The book includes a plausible sounding plea to join this cult, as well as the character of a sinister and threatening Christian minister. So if that would bother you in a novel, you should avoid this book. As for me, I didn’t particularly like those details, but it’s not as if they suggest that all Christians are like this minister, or that joining the Church of Satan is a good idea. (Warren isn’t interested.) I wanted to know what happened to the character, so I read on. With all his quirks and weaknesses and shadowy past, he’s someone I find myself rooting for. Arcade Publishing, New York, 1995. 107 pages. We wanted the students not only to be awakened to a world of poetry through other people’s choices, but to become aware of a world of need outside their immediate communities, one to which they could in some way contribute. The proceeds from the project went to charity. For two years, the students wrote to well-known people in all fields. Every day, they awaited the mail with eager anticipation. When a reply arrived it was greeted with curiosity and excitement. Each letter and accompanying poem was read in class and the poem and poet discussed. We greatly enjoyed finding out why people had selected a particular work, and we learned from what they had to say about it. What most struck all of us was how important poetry had been in the lives of the contributors, who had turned and returned to poems for amusement, solace, wisdom, and perhaps most importantly, to find some part of themselves. All of the poems in this book are someone’s favorite, which means it makes good reading. The students included the letters sent by the celebrities, in most cases explaining why they chose that particular poem. Then the poem itself is included. 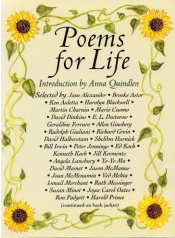 Contributors include people like Mario Cuomo, E. L. Doctorow, David Halberstam, Angela Lansbury, Yo-Yo Ma, Joyce Carol Oates, Diane Sawyer, Beverly Sills, Stephen Sondheim, and Kurt Vonnegut. This collection provides pleasant, fun, and many times inspiring reading. MacAdam/Cage, San Francisco, 2005. 197 pages. 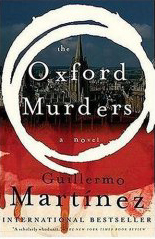 This delightfully philosophical murder mystery was written by a man from Buenos Aires with a PhD in Mathematics. Of course I liked it! The character telling the story is a PhD student from Argentina studying at Oxford. He’s staying in an apartment owned by the widow of a great mathematician. One day, soon after he arrived at Oxford, he encounters an eminent logician and together they discover the old woman dead, murdered. The murderer has left a note, apparently a challenge to Dr. Seldom, the logician. The note refers to the murder as the first of a series, and includes a symbol, a circle. Sure enough, there’s a second murder, along with the symbol of a fish, drawn from two curved lines. Part of the fun is this book is the mathematical aspects of the case. Dr. Seldom explains that they still don’t have enough information to determine the next symbol in the series. In fact, they can never be absolutely sure they have found what the murderer is thinking of. But perhaps if they can figure out the next item in the series, they can solve the crime. I thoroughly enjoyed this story, a good mysterious puzzle, as well as some interesting things to think about. Bloomberg Press, Princeton, 2001. 126 pages. My son checked out several collections of New Yorker Cartoons and this one was my favorite. These cartoons rang true in my life much more than the ones about dogs or cats or money or lawyers. With several of the cartoons, I wanted to call up friends and read it to them.—I decided to review it instead. The cartoons by Roz Chast were some of my favorites. From the introduction, I learned that she’s a mother, too—and she has an eye for the hilarious moments of motherhood. For example, there’s one that shows the Berlitz Guide to Parent-Teacher Conferences. We see that when you hear the phrase “She’s a riot!” in teacherese it means, “I can’t stand her.” When you hear “He’s doing just fine,” that means “What’s your kid’s name again?” Okay, maybe it’s not what the teacher is really thinking, but it’s certainly what the parents fear she is thinking. But the Roz Chast cartoon that got me laughing uproariously was the one of “Bad Mom Cards.” (“Collect the Whole Set.”) the cards show pictures of bad moms like Suzie M. who “Let kid play two hours of Nintendo—just to get him out of her hair.” Or the awful Deborah Z., who “has never even tried to make Play-Doh from scratch.” And those are only two of the horrible things these bad moms have done to their kids. I love the way this cartoon plays off the guilt we feel about the silliest things. The best antidote I can think of to being that kind of a Mom is to learn to laugh at yourself. Laughing at the people in this collection is a good start. Simon Pulse, New York, 2006. 372 pages. 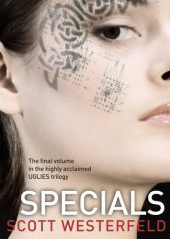 Specials is the dramatic conclusion to Scott Westerfeld’s Uglies trilogy. As before, I don’t want to say too much about what happens, because that will give away the ending to the earlier book, Pretties. This third book focuses on the department of Special Circumstances—run by the “Specials.” While “Pretties” are beautiful and empty-headed, Specials have a cruel beauty. They look perfect, but haughty and superior. The effect is frightening when combined with their pointed teeth and nails. What’s more, the Specials have superhuman abilities—with bones crafted of unbreakable aircraft ceramics, muscles sheathed with self-repairing monofilament, and heightened senses and reflexes. The Specials are after the Smokies who want to reverse the effect of the surgery on the Pretties’ brains. The Smokies want people to think for themselves, and then what will become of the world? These books are absorbing and exciting. My friend, who also heard Scott Westerfeld speak at the Bologna writer’s conference, was mad at me for snapping it up when it came to the library. Fortunately, I was already planning to read it as soon as it came in, and now I’ll pass it on to her. This is science fiction with teens that seem real—complete with love-hate relationships, conflicting emotions, and complex feelings. Sometimes they screw up, and when you’re “Special,” that can cause a major disaster. Random House, New York, 2006. 269 pages. 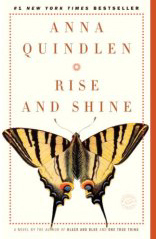 I like Anna Quindlen’s writing. She creates depth, windows into people’s souls. This book is the story of Bridget Fitzmaurice, a social worker in Manhattan, and her older sister Meghan, one of the most recognized people on TV, the host of Rise and Shine, a network’s morning show. When Meghan lets something slip on the air that she shouldn’t have, it looks like her career is over. When Bridget learns about the other pressures in Meghan’s life behind that, she wonders if she really knew her sister. Will any of their lives ever be the same again? Well, no. We all grow and change. This novel looks at a window of time when the lives in one family change dramatically. Perhaps partly I liked it because Bridget is almost exactly the same age as me—and it’s a time of change for me, too. If someone told me the plot of this novel, I’m not sure I would have thought I’d like it. But in Anna Quindlen’s hands, it’s a treasure. You enjoy getting to know these people. Crown Publishers, New York, 2005. 249 pages. 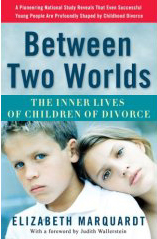 Starred Review.Between Two Worlds is a book written by a researcher whose parents were divorced when she was a child. She attempts here to give the story of divorce from the perspective of the children involved, for a change. She didn’t rely on her own experience, but conducted an extensive study of well-functioning children of divorce. Previous studies have tended to focus on children who don’t cope well. What about the resilient children? What about “good divorces”? Are those children, in fact, just fine with the divorce? One major national study has turned up an important finding that helps clarify the question of when divorce is necessary. The researchers found that one-third of divorces end high-conflict marriages, in which the parents report physical abuse or serious and frequent quarreling. Not surprisingly, the children do better after these high-conflict marriages end. However, two-thirds of divorces end low-conflict marriages, in which the parents divorce because they are unhappy or unfulfilled, or have other problems that are not seriously threatening. The children of low-conflict couples fare worse after divorce because the divorce marks their first exposure to a serious problem. One day, without much warning, their world just falls apart. Only recently have we had a large percentage of adults who have grown up in divorced homes. Elizabeth Marquardt feels that it’s time to talk about divorce from the children’s perspective—not guessing what the children feel, but asking them. The individual stories of children of divorce point to the lingering loss and pain that result from divorce even when the children look “fine.” The long-term studies point to some of the obvious and troubling differences we possess as a group. But no one has stepped back and explained how divorce changes childhood itself. The new study reported in this book explains how divorce reshuffles many core features of middle-class childhood that our society takes for granted and, in the process, shapes children’s identities well into young adulthood. This larger story must be told because, as a society, we still have not grasped just how radical divorce really is. Too many people imagine that modern divorce has become just a variation of ordinary family life, like growing up in a large family, perhaps, or in a military family that moves a lot. Sure, there may be some discomfort, and some of the kids may end up with big problems, but doesn’t childhood as we know it stay basically the same? Most people assume the answer is yes. They are wrong. In reality, divorce powerfully changes the structure of childhood itself. The idea of the “good divorce” is attractive to many. Some divorced parents are reassured because it suggests steps they can take to try to protect their children if they must end a very bad marriage. Other parents like the idea of a “good divorce” because it suggests they can end a marriage that may be okay but not completely satisfying and still do right by their children. Family court judges welcome it because they want to make arrangements that, whenever possible, keep both parents in the child’s life, and they want to minimize conflict between those parents. Some therapists like the idea because they want to help these families and a “good divorce” gives them a role in teaching parents how to divorce. In addition, many social observers, including journalists, academics, and opinion leaders, like the idea of a “good divorce” because it promises to alleviate much of the anxiety our society has about divorce. What really matters, the experts assure us, is how the parents get along after the divorce, not the divorce itself. The premise of the “good divorce” sounds logical. Surely, if divorce does happen, it is better for children not to lose significant relationships entirely, nor to be drawn into bitter, unending fights. However, when you talk to the children themselves you find that the popular idea behind the “good divorce”—that the quality of the divorce matters more than the divorce itself—is actually an adult-centered vision that does not reflect their true experiences. While a “good divorce” is better than a bad divorce, it is still not good. For no matter how amicable divorced parents might be and how much they each love and care for the child, their willingness to do these things does absolutely nothing to diminish the radical restructuring of the child’s universe. As the author goes on to point out specific difficulties, she explains why the very structure of divorce pulls children between two worlds. A primary challenge of marriage is for two separate people to become one couple, to reconcile their needs and experiences in ways that allow them to care for each other and to avoid unnecessary strife. Couples wish to meet this challenge even if they do not have children because they know they will both be happier if they can live together in relative harmony. But the stakes are higher when they have children, because now they are raising a new person who will be strongly shaped by the environment they create. When married parents are successful in their attempts at bringing together their two worlds the results are apparent as they resolve differences, back each other up in front of the child, or try to understand and adapt to each other’s quirks. When they are less successful their attempts at making sense of their different ways of living may be expressed by fighting, criticizing the other parent in front of the child, or trying to change each other’s irritating habits. Yet however well or poorly they handle the challenge of negotiating their differences, an important but often ignored feature of married life is this: The work of making sense of their two worlds is the parents’ job, not the child’s. Everyone agrees that only bad parents would tell a young child “I think you should do this, but you father thinks you should do that. So you decide.” When parents disagree they are expected to confront each other about it. Whether they confront each other behind the scenes or in front of the child, with hostility or with dignity, is very important, but it is not the only important issue. What is equally important is that it is the parents’ job to bridge their differences; even if they do their work badly no one would say that their child should attempt the job instead. Our society pins the success or failure of family conflict resolution squarely on the parents. Making sense of two ways of life is an active experience for married couples. They have to work at it and some couples do it better than others. But even when couples are angry and avoiding each other—not actively bridging their differences or openly conflicting—the simple fact of the marriage holds them together and remains larger than the differences that divide them. The unifying quality of being married is difficult to see, but it is a constant undercurrent in the life of a married couple. It is the background music between the fight scenes, the subtle strains that we don’t hear until someone points them out to us…. Even when they are angry and avoiding each other, they still live in the same home and continue to share an identity as a married couple. Even when they don’t particularly feel “married,” they’re still married. Despite their differences they are still a unit in the child’s eyes—“parents”—and dealing with the conflicts between their worlds, however well or poorly they do it, is still their job. Moreover, to focus on conflict and unhappiness to this extent is really to overstate the problem. Every married couple has conflicts but only some of them have very serious, ongoing conflicts that threaten their or their children’s well-being. Divorce is an important option for these couples. For most married couples, however, the real need is to learn how to handle conflict better. In most marriages, the overriding achievement is the ever-unfolding, never-perfect, but nevertheless critical knitting together of two worlds into one marriage and one family life. Much of this process, while subtle, appears in intact families to be natural and therefore unremarkable. Of course married parents attempt to give their child one family and way of life. Of course most children, especially when they are young, see their parents as a unit with largely similar beliefs and expectations. This is the most basic stuff of family life, after all. Except, for many children today, these basic features of family life cannot be taken for granted. It is at this point that the experts fall silent. There is a widespread assumption in our society that if parents manage to minimize conflict after the divorce, they will create something like an intact family for their children, because the children will still have a mom and a dad in their lives. This assumption is wrong. In fact, the postdivorce family, no matter what the level of conflict, is an entirely new kind of family that lacks many features of intact family life that might seem natural and unremarkable. At times these parents may conflict, but if they are seeking to minimize disputes they do so largely by staying out of each other’s way. Observers may see an admirable absence of conflict, but from the child’s point of view what these divorced parents have achieved is the creation of two separate worlds for their child to grow up in. It is certainly better for the child if there is little open conflict between the parents rather than a lot. A high degree of conflict reinforces the division between the two worlds and creates additional pain. But a mere absence of conflict between divorced parents can never begin to knit their worlds together in the way that being married does. This was the overarching concept that gives the book its name, and it came up again and again in the surveys and interviews of the study. Divorced parents stay out of each other’s worlds, retreating to their own worlds. Where does the child stand? As children, we became travelers between their worlds. Sometimes we stood in one world, sometimes in the other, but in our own minds most often we were suspended uncomfortably somewhere in between. We were like the football I imagined myself to be as a child, hurtling between my two parents. When they divorced, our parents successfully separated their two identities. But we remained the bridge between them, seeking to make sense of two increasingly different ways of living as we forged identities of our own. In other words, after a divorce the task that once belonged to the parents—to make sense of their different worlds—becomes the child’s. You don’t necessarily see the conflict in the heart of a child of divorce. To outside observers, the children of divorced parents may look no different than the children of intact parents. We ran on the playground, went to school, argued with our siblings, played with blocks, drew pictures in our bedrooms. But we were also vigilant. When Mom came home we gauged her mood. When we stayed at Dad’s we were often quiet and on good behavior. We paid close attention to the different rules at each parent’s home and the conflicts in their expectations of us. We wondered if we looked or acted too much like our father and if that made our mother mad at us. We struggled to remember what we were not supposed to say, what secrets or information about one parent we should not share with the other. We adjusted ourselves to each of our parents, shaping our habits and beliefs to mimic theirs when we were around them. We often felt like a different person with each of our parents. Our parents may no longer have been in conflict, but the conflict between their worlds was still alive. Yet instead of being in the open, visible to outsiders, the conflict between their worlds migrated and took root within us. When we sought our own identities—when we asked “Who am I?”—we were confronted with two wholly separate ways of living. Any answer we gleaned from one world could be undermined by looking at the other. Being too much like Dad could threaten the Mom-self inside us, and vice versa. These conflicts were not raised in conversation with or between our parents, or with anybody else, but internally. We were one in our bodies but we did not feel one inside. Even the “good divorce” left us struggling with divided selves. She points out that people don’t want to hear what children of divorce really go through. You will find only a few books on divorced families, at least in proportion to the number of divorced families in this country, and most of them are upbeat guides on how to divorce rather than in-depth looks at the lives of children of divorce. Strangely, our culture seems only too happy to talk about dysfunctional intact families—to point fingers at all the ways married parents can mess up with their children—but it falls silent about divorce because no one wants to make divorced parents feel bad. Some people might even get the erroneous impression that the average divorced family is better for children than the average intact family, whose problems are so often bared to the world. Our study showed that children of divorce, even those who appear to be fine and successful later in life, are much more likely than their peers from intact families to share profound and moving stories of confusion, isolation, and suffering. Most people do not expect children to be deeply absorbed by their parents’ needs and vulnerabilities, but children of divorce often say we were. Most people do not expect children to confront complex moral questions early in life, but as children of divorce we routinely did. Most do not expect children to feel like outsiders in their homes, but we often felt that way. Most do not expect children to keep secrets from their parents, but we often did. Likewise, most do not expect that children will approach God from a place of suffering and isolation, but that is how we often explain our spiritual journeys. Most do not expect children to feel like a different person with each of their parents, yet children of divorce are likely to say we did. When our parents divorced we did not just suffer a bump, leaving us with a few bruises that quickly faded. Our childhoods were turned inside out in ways that have been largely secret and silent—until now. The rest of the book goes into details about these issues, tells stories from people who were interviewed, and explores the repercussions in kids of being pulled between two worlds. I’ll admit that at the beginning of this journey I was angry. I was tired of all the wrongheaded assumptions about my life. Too many people thought that because my parents loved me and didn’t fight, or because their divorce took place before I could remember it, or because I had managed to grow up and become a reasonably functional person, then the divorce must not have been a big deal. I felt that my parents and the culture at large had very little understanding of my real experience. I still sometimes get frustrated with my parents, as anyone does, but I don’t feel angry with them anymore. The decision they made was a very long time ago, when they were only twenty-one years old. When they split up, leading experts assured parents that as long as they found happiness their children would be happy too. Some experts even insisted that parents in unhappy marriages had a duty to divorce or they would irrevocably damage their children. More nuanced ideas about happiness—that there are degrees of unhappiness in marriages, that marital happiness can go in cycles, that divorce doesn’t necessarily make adults happy, that children’s natural inclination is not to worry about their parents’ happiness so much as their own—did not have much influence in the early seventies…. But I am still angry at the culture. It’s five years and counting into the new millennium. We’ve seen the effects of widespread divorce unfold for over three decades. Some big studies have been done and the first generation of children of divorce has grown up and started to speak out. Yet in the debate about divorce, our culture is still turning its back on children. For the generation who raised us and for divorced parents today, the story told in this book is a new one. Upbeat language about divorce—call it “divorce happy talk”—is all around us. Such talk can be well-intended. Divorced parents are vulnerable and worried about their kids. Experts want to offer them reassurance and helpful advice. But when divorce happy talk minimizes, distorts, or ignores the pain felt by children of divorce, it crosses over into the realm of harm. These glib, overly optimistic assumptions about divorce hurt my generation as we grew up and they are harming a new generation growing up now. My question is this: Can our culture get honest about children of divorce? In the end, divorce happy talk indicts itself. In the breathless portrayals of the upside of divorce, it is all too easy to spot a defensive awareness of the huge downsides. If they’re honest, everyone knows that divorce hurts a lot. Even people who want to end their marriages find divorce wrenching and disorienting. Divorce routinely makes it to the top of the list of life’s most stressful events that are likely to send a person spiraling into depression. Yet few other events on the list inspire the endless books, magazine articles, websites, and talk shows devoted to looking at their upside. Why? Because unlike losing your job, or having your spouse die, or facing serious health problems, divorce is a choice that at least one adult in the marriage makes. Divorce happy talk is our culture’s attempt to reconcile two competing desires: the desire to accept widespread divorce and the desire to raise happy, healthy children. These two desires are in direct conflict. To date, the culture’s main way of confronting this conflict has been denial in the form of happy talk. Happy talk misleads adults about the true nature of divorce. It portrays divorce as an orderly, perhaps even plannable event rather than a major upset that opens new, unexpected, and unwelcome doors. It minimizes the pain and chaos that often follow divorce and, in doing so, encourages parents who may be in troubled by salvageable marriages to split up. The most serious problem with divorce happy talk is that it lies to children. Children of divorce typically experience painful losses, moral confusion, spiritual suffering, strained or broken relationships, and higher rates of all kinds of social problems. But divorce happy talk insists that children’s experience is just the opposite. It declares that postdivorce family life is a fun challenge. It chirps about the new people who become part of one’s family, the fresh unity of remarriages, the adventure of traveling between two worlds. When divorce happy talk does realistically confront the stresses of divorce, it pretends that just saying them out loud will make the pain go away. Either way, the misnaming of our actual experience makes it even more difficult to recognize and share our true feelings and eventually to heal. She points out that the standards for children of divorced parents and married parents are very different. How often do married parents send their child away from home for days, weeks, months, or years at a time? How often do married parents spend routine, non-work-related nights apart from their kids? How often do married parents put their children on an airplane by themselves? How often do married parents divide their financial responsibilities for their children down to the penny? How often do married parents take each other to court? How often do married parents sleep with someone besides the child’s parent in the house when the child is present? How often do married parents read their children books that portray painful losses that the children might have experienced as fun adventures? Certainly, married parents do not avoid doing all of these things, and divorced parents do not do all of them. But these actions are common among divorced parents, so common that no one thinks twice about them. It is almost unheard of for married parents to do any of them. Yet the needs of children of married parents and children of divorced parents are the same. They are the same species. So why are children of divorce considered so resilient? Because the adults need them to be that way. Some of us, many more than those from intact families, struggle with serious problems…. Yet those who are visibly suffering are not the entire story. They’re the tip of the iceberg. The others, the ones without seriously disabling problems, are everywhere—at your workplace, at school, at church. We don’t look much different from anyone else. We might seem a bit more guarded, a bit slower to make new friends, a bit more anxious about life in general. But we do manage to make friends, fall in love, accomplish goals, succeed at work; some of us do quite well. If you ask about our lives, though, you’ll discover that our parents’ divorce is central to the story of our childhoods and to who we are today. We grew up too soon. We were not sure where we belonged. We often missed our parents terribly when we were not with them. Some of us longed to be like our parents and yet agonized if we resembled one of them too closely. We had to figure out things for ourselves—what is right and wrong, what to believe, whether there is a God. We never knew we could ask for help if we needed it. When we faced struggles, we thought it was up to us alone to make sense of I, because the silence about our childhoods seemed to leave us little other choice. Those of us who successful have more in common with the visibly suffering children of divorce than you might think. The fact that we managed to come through it, get jobs, maybe go to college and build careers—these accomplishments do not necessarily imply that our parents handled the divorce better than others. Some children survive devastating experiences and ultimately become stronger for it. Others are broken by the same crises and remain tormented. To look at any of us who survived childhood divorce and conclude that our childhood and the divorce itself must have been “fine” shows little understanding of the enormous losses in our lives or of the capacity of the human spirit to survive and flourish despite adversity. Those of us who are children of divorce are not all falling apart, but neither are we willing to be held up as proof—convenient proof—that kids don’t really need both parents. We needed our mothers and fathers, living together, married to each other, preferably getting along well. If our parents could not stay together, we needed and deserved to grow up in a society that faced up squarely to our loss, that refused to engage in happy talk, that resisted the temptation to call children resilient in order to defend adult decisions. We now know what divorce does to children. Let’s give the children what they need. If you have kids and are considering divorce or are being divorce or are divorced, I highly recommend this book. Even if you can’t avoid it, at least you can have a better idea of what your kids are going through. It will help you keep from minimizing their experience by engaging in happy talk. And if it makes someone rethink the decision to get divorced, all the better. It certainly inspires me—however much I start feeling I should give up on my marriage—to continue to pray for restoration and a forgiving heart. Maybe I could find a better husband. But my kids could never ever find a better Dad. Harcourt, Orlando, 2006. 243 pages. This book, another “Thrilling Tale” in the spirit of Whales on Stilts, is a delightful spoof of children’s series books. Both my sons, ages 18 and 12, read this book, and laughed so much and read bits aloud so often, I simply had to read it myself. It may not be great literature or a terribly compelling story, but it is hilariously clever. Katie Mulligan, her friend Lily, and Jasper Dash, Boy Detective, are ready for a vacation, so they take advantage of a coupon for a free dinner at the Moose Tongue Lodge and Resort. Once there, they learn that the coupons are fake—and many other people, all stars of series books, have received them as well. Then the Hooper Quints are kidnapped on their way to the hotel. Which of the dashing detectives will be able to solve the mystery? Then a valuable necklace is stolen while people are out searching for the quintuplets. Are the two mysteries tied together? The story isn’t the point of this book. It’s got lovely unlikely plot twists, just like the series books they are spoofing would have. Here’s the first section that my 12-year-old felt he HAD to read to me. It’s talking about how Jasper Dash’s books are somewhat out of date. Often, if you go to a town library and under Keyword Search type “Jasper Dash,” you’ll come up with a list of his books—and beside each one, it says: “Withdrawn. Withdrawn. Withdrawn. Withdrawn.” This means that they are no longer in circulation. Some librarian has taken them off the shelf, wiping away a tear, and has opened the book to the back, where there’s a pouch for a card dating back to the time of the Second World War, and she’ll crumple up the card, and then she and her fellow librarians will take special knives and slice away at the book and will eat the pages in big mouthfuls until the book is all gone, the whole time weeping, because they hate this duty—it is the worst part of their job—for here was a book that was once someone’s favorite, but which now is dead and empty. And the little cheerful face of Jasper Dash, heading off to fight a cattle-rustling ring in his biplane, will still be smiling pluckily as they take their Withdrawal Knives and scratch his book to pieces. M.T. Anderson is seven monkeys, six typewriters, and a Speak & Spell. It took them ten years to write The Clue of the Linoleum Lederhosen. Their previous books include Adf2yga^vvvv, WpolwOox.S Ppr2dgn shr Elssf, and The Riverside Edition of the Complete Works of William Shakespeare. Adf2yga^vvvv was a National Book Award finalist. The M. T. Anderson Monkey collective is located outside Boston. Its hobbies include flash cards, hopping, and grooming for lice. It divides its time between the parallel bars and the banana trough. Who wouldn’t want to read a book with such a blurb? Firebird (Penguin), New York, 2002. 247 pages. If a book is put out by Firebird, it’s a good bet that I will like it. I hadn’t heard of this author before, but if Firebird’s editor, Sharon November, thought it good enough young adult fantasy to reprint, I knew I would probably enjoy it. I was not disappointed. Cassie’s grandfather has been put in the hospital, and her mother expects Cassie to come along and take care of him, even though he didn’t recognize Cassie on her last visit. It would mean that Cassie would have to miss the violin recital she’s long been working toward, but as usual she gives in to her mother. It doesn’t take Cassie long to figure out that something strange and sinister is going on. For starters, her grandfather’s house is filthy and someone has broken things to pieces. But it somehow involves that strangely attractive man on the motorcycle, whom Cassie met before she left. And the kind fiddler who sent him away. And the odious neighbor whom everyone at the hospital thinks is wonderful and helpful to her grandfather. The struggle ends up being nothing short of war between fairy clans—including one that is hostile to humans. This book reminded me very strongly of Patricia McKillip’s Solstice Wood, with the wayward child (Cassie’s mom) coming back at the death of the owner of the house with a connection to fairyland. I found Hannah’s Garden captured my heart more than Solstice Wood did. Perhaps the younger protagonist caught up in these things helped, but Midori Snyder’s writing style also drew me in. by Bernie S. Siegel, M.D. HarperPerennial (HarperCollins), New York, 1998 (first published in 1989). 295 pages. Starred Review.In this book, Bernie Siegel looks at healing, and the way our attitude and spirit can aid in our own healing. In the foreword to the new edition, he talks about living a full life. Don’t follow my advice to avoid death. Follow it to celebrate life. Let there be no need for therapy in heaven to work out resentments of all the things you did to not die, and all the fun you missed out on while exercising, meditating, and preparing your vegetables. He begins the text of the book looking at how love, joy, optimism can actually change your physiology. What we get back to again and again is that, although there’s no question that environment and genes play a significant role in our vulnerability to cancer and other diseases, the emotional environment we create within our bodies can activate mechanisms of destruction or repair. That’s why two people who grow up in the same environment, even when they have the same genes, as identical twins do, don’t necessarily have the same disease at the same time. A man showed up in my office at age fifty-nine with cancer. Some thirty years before, his identical twin had died of cancer. He told me that until recently he had always been happy and busy, but he had just been through a year of total despair and depression and had wanted to die. His brother, however, had always been unhappy. Sometimes it’s not so much a matter of disease grasping us as of our being susceptible to the disease. 1. Do you want to live to be a hundred? 2. What happened in the year or two before your illness? 3. Why do you need your illness and what benefits do you derive from it? 4. What does the illness mean to you? 5. Describe your illness and what you are experiencing. He gives fascinating descriptions patients gave of their illness which helped them get to the root of what was happening and heal themselves. By calling your attention to feelings and problems you may not have been aware of, the disease may be the first step in overcoming them. That’s one of the reasons why I think the five questions are so important and why I hope more doctors will use them in addition to the traditional review of systems. He talks about how coincidences are “God’s way of remaining anonymous.” He says, “Once you start to become receptive to these messages, you get more and more of them.” This, coincidentally, fits in perfectly with another book I’ve been reading, Guidance 24/7, by Christel Nani. When you are open and aware, you will have them in your life. They help you get in touch with the schedule of the universe, as opposed to your own personal schedule, which relates only to questions like, “Am I late? How do I look? What do other people think?” They get you to look at the real questions: “How can I live and understand the moment?” Diseases can be our spiritual flat tires—disruptions in our lives that seem to be disasters at the time but end by redirecting our lives in a meaningful way. These will occur more often when you are in touch with your intuitive, unconscious awareness. Then he talks about the doctor-patient relationship, and how his patients help him. I have always made a distinction between healing and curing. To me “healed” represents a condition of one’s life; “cured” relates strictly to one’s physical condition. In other words, there may be healed quadriplegics and AIDS patients, and cured cancer patients who are living unhealthy lives. What this means to me is that neither my patients nor I need ever face the inevitability of failure, for no matter how life-threatening their disease or how unlikely a cure, healing is always possible. There’s much profundity in his message. The doctor I would want for myself or for anyone else I cared about would be one who understands that disease is more than just a clinical entity; it is an experience and a metaphor, with a message that must be listened to. Often the message will speak to us of our path and how we have strayed from it, so that our life is no longer a true expression of the inner self, or, as Larry LeShan would say, we are no longer singing our own song. Only by listening to that message can we mobilize all the healing powers that lie within, and that is what the doctor must help each patient to do. Accept your mortality and live your life, reach out for the help you need and accept it. To do so is a gift to those around you. You become their teacher and healer. While explaining how important it is the way you think about your illness, he tells about a study done with dogs that focused on “learned” helplessness. Similarly, people may learn helplessness if they have had repeated experiences of being unable to change external circumstances through their own efforts, especially if this sense of helplessness was learned early on from parents who gave them very little autonomy and had no personal sense of autonomy in their own lives. One example of a cognitive change you can make is to interpret the side effects from your medications not as just another of your afflictions, but as evidence of something positive happening. What is suggested by the Harvard study and a growing body of similar work is that our mental attitudes affect first our susceptibility to disease, then our ability to overcome it. Does this mean that sick people must bear the burden not only of their illness but of responsibility for having gotten sick in the first place? Viewing disease as a sign of personal inadequacy or culpability is both cruel and false….I hope all therapists, doctors, family members, and friends never make people feel like failures, or make them feel that they are still ill because they have not changed enough, achieved enough or made significant enough existential shifts. That is why I focus on teaching people how to live, not how to not die, for that is something that is always within their ability. He talks about how much damage is done because people don’t love themselves. We’re so self-destructive there have to be laws—what I call please-love-yourself laws—even to get us to wear seatbelts or helmets. We poison and numb ourselves with cigarettes, tranquilizers, drugs, alcohol and unhealthy diets, and we seek out relationships that can never work in a desperate attempt to convince ourselves of our own value. No relationship in the world can make us feel worthy if we don’t know that we are. Yes, I do think there may be things happening in a child’s family life that can contribute to illness. I say that not to assign blame but to empower people, to give them insight into positive ways of dealing with illness if there are family problems they can do something about. I want them to respond with love, not guilt; I want to turn on the repair mechanisms, not create further breakdown. We’re used to the idea of disease as a punishment or a failure—but a gift? He talks about lessons he’s learned from people who accept their diseases with grace. We too have to learn to step back and start saying, “We’ll see.” Instead of judging the events in our lives as good, bad, right or wrong, we must recognize that of itself nothing is good or bad, and everything has the potential to help us get back on the universe’s schedule. This does not mean that we have to like what happens, simply that we must remain open to the uses even of adversity. A disease may serve as a redirection—or, as I often describe it, a reset button (which starts you up again the same way the reset button works on a jammed garbage disposal). When you learn to live your life with a “we’ll see” attitude, you will understand how it is that disease can be considered a gift. You will know why it is that people asked to describe their illness have called it a beauty mark, a wake-up call, a challenge and a new beginning. I want to add that this can apply to any trial in your life. I’m beginning to think of my own marital separation and the illness I had along with it as God’s Accelerated Program for Personal Growth. (The illness is what got me reading books like this.) Now I’m paying attention to things God wants to teach me. Perhaps He had been trying to teach me those things for years before—but now that I’m in the middle of trials, I’m actually learning. Does it take courage to be open to this kind of healing? Sure. Do I have the right to tell you your disease is a gift? No, I do not. The gift is yours only if you choose to create it—as I’ve seen thousands of others do. Listen to the people who have lived the experience, and realize you are the source of your healing. Cancer, death or loss are not the issue but love and healing are, and we finally see that in the pain lies the opportunity to love and care even more. As Mother Teresa has said, the greatest disease of mankind is the absence of love. There is only one treatment for that, to let in the loving light and to heal your life. He talks about taking control of your own treatment, as well as asking for help when you need it. One characteristic of people who have achieved peace of mind is their independence. They trust their instincts. Nobody can tell them what to think if their inner voices say otherwise. He is quick to point out that everyone dies, eventually. If you choose to be exceptional and confront life’s challenges, after you are gone your loved ones will go on living with a fullness, not an emptiness. Yes, there will be grief, but not emptiness. I have spoken around the country at memorial services held by family members of those who have died. And these people are living memorials to their loved ones, because they bring something back to the community, a way of sharing what they have learned about life from the individual who died. It is wonderful to see this happen because it means that life and the message of that person’s life have continued. What we’re talking about is taking on the challenges of life, not living forever. I think that every spring when the leaves come out, if you look closely you’ll see that each one is slightly different. Some are reddish, some bright green, some pale, and they have different shapes and sizes too. But picture yourself as a maple leaf coming out. You think of how you can express yourself by manifesting your uniqueness, but the other leaves on the tree say, “Hey, this is a maple tree, fit in. You’ll be green and this shape. Do you want people to look at us and point and say, ‘What a funny tree’?” You want to be liked, so during the spring and the summer, when the sun is shining and you have plenty of food, you turn the same green as everybody else, take the same shape and fit in. Then the fall comes and it gets cold, and some of the guys who were telling you how to behave start dropping. You’re still hanging on, but you realize that you’re not going to be able to hang on forever, and if you’re not, then you’d like to let everyone know who you really are before you let go of the Tree of Life. So the green, which is a cover-up, goes, and you become your unique individual beautiful self. Then you hang on as long as you want. There are still some dried-up scrawny leaves hanging on even in January, just as there are some dried-up scrawny specimens walking the streets. But this is an individual choice—how long you want to hold on to the Tree of Life, how long before you can feel that you’ve shown your true colors and lived your life. If you have lived and had your moment, then it will be much easier to let go. You will know and your loved ones will know your unique beauty, and it will be something they remember and live with. Truly this is a wise, beautiful, and loving book. You are currently browsing the Sonderbooks blog archives for September, 2007.